BUFFALO, NY--(Marketwire - Jan 30, 2012) - Delaware North Companies Gaming & Entertainment is one of the most innovative gaming and racing operators in the country. With nearly 100 years of experience in the hospitality industry, the company's gaming management services team specializes in creating unique experiences one racing venue or casino at a time. By studying the guest experience and examining revenue-building opportunities, Delaware North's gaming management experts develop sought-after amenities and services that provide guests with a well-rounded experience and serve to improve the property's bottom line. "At Delaware North, our gaming management services group provides site-specific recommendations designed to keep guests entertained in a number of ways. They can play a casino game, relax and have dinner or hit the shops. We even have locations that offer the thrill of live racing. Because we take a holistic approach to providing hospitality, gaming and entertainment services, our team understands how to create a world-class experience under one roof," said Bill Bissett, president of Delaware North Companies Gaming & Entertainment. Currently, the company oversees more than 10,000 video gaming machines throughout the United States and operates successful racing and gaming operations in New York, Arizona, Florida, West Virginia, Illinois and Arkansas. 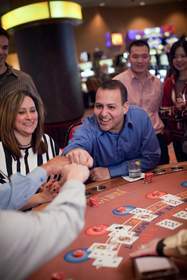 To learn more about Delaware North's gaming management services, please visit http://delawarenorth.com/Gaming-Services.aspx. Delaware North Companies is one of the world's leading hospitality and food service providers. Its family of companies includes Delaware North Companies Parks & Resorts, Delaware North Companies Gaming & Entertainment, Delaware North Companies Travel Hospitality Services, Delaware North Companies Sportservice, Delaware North Companies International and Delaware North Companies Boston, owner of TD Garden. Delaware North Companies is one of the largest privately held companies in the United States with revenues exceeding $2 billion annually and 55,000 associates serving half a billion customers in the United States, Canada, the United Kingdom, Australia and New Zealand. For more information, visit www.DelawareNorth.com.